As billionaire kidnap kingpin, Chukwudumeme Onwuamadike a.k.a Evans is facing trial in a Lagos court over his alleged criminal activities, another ‘rich’ kingpin, Isah Maiturari, has been apprehended by the police in Niger State. Unlike Evans, Maiturari upon his capture surrendered to fate, saying that he wants to die. These were the prayers of 61-year-old Isah Maiturari, a notorious kidnap kingpin and dealer in most stolen cars in Niger State. Maiturari who hails from Paikoro Local Government Area of Niger State was arrested for the eight-time in 29 years last week when he was picked up by men of the Inspector General of Police’s (IGP) “Operation Absolute Sanity” from his resident at Sauk Ka Futa, a suburb of Minna, the Niger State capital. Maiturari, a father of 29 children and three wives had flourished in criminal activities, ranging from kidnapping to receiving and selling of stolen cars within Niger, Kogi, Kaduna and Kano states, as well as the Federal Capital Territory, Abuja. The Sun reports that in his four years as king of kidnappers in the state, Maiturari said he and his gangs realized well over N720 million from ransom paid by families of their victims. “I was having so many problems from the kidnapping business so I had to leave it and entered into buying of stolen cars and I have been doing that for 29 years now. “Although I left the business in 2013, but I came back to it again three years ago because of the current hardship. “But I have told God that I want to die this year, I am tired of this life. I want God to take my life this year, please let me die,” he told Sunday Sun. Maiturari, however, said that he has no regrets over his criminal activities, which had made him to go to jail seven times. “I have no regrets for what I have done in the last 29 years, but now it is time to die, and that is what I am waiting for, I told God that I want to die this year,” he stressed. It was gathered that in the last 29 years, Maiturari has been arrested and charged to court seven times, sentenced and jailed, but he had always regained his freedom in a dramatic manner. It was also revealed that each time he regained his freedom from prison, Maiturari would put a call across to the security agents to taunt them, by telling them that he was out of prison and would begin business as usual. In 2001, Maiturari was chased out of the state by the late former Governor Abdulkadir Kure, and he relocated to Kano State where he continued his stolen car business. The die-hard kidnapper who is also a trans-border dealer in stolen cars has his customers scattered across Nigeria and Niger Republic. His major markets within Nigeria are in Kano, Kaduna, Abuja, Lagos and Sokoto states. Sunday Sun gathered that Maiturari who is said to be very meticulous with the proceeds of his crime has over 35 choice houses in Minna, Kaduna and Kano states. He said that he bought his first stolen car for N400 and sold it for N800 in Kano. According to him, the car was brought home by one of his sons who told him that the owner wanted to sell it. That was the beginning of his journey into dealing in stolen cars, and for 29 years, Maiturari reigned supreme that made people in Paiko community to wonder if he was above the law. And because of his criminal lifestyle, the kingpin who is from a well-known family in Paiko severed relationship with his other family members, except his wives and children. Thus while he was arrested and paraded with one of his sons, all the three wives were at the Bosso Divisional Police Station where he was paraded to show solidarity to him. 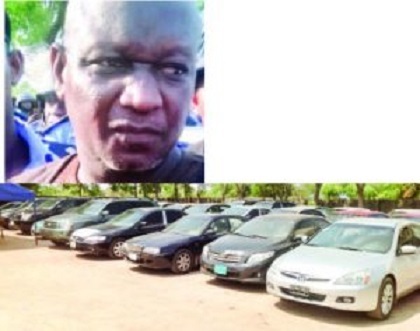 Since his arrest, Maiturari has helped the police to recover about 35 vehicles from Lagos, Kaduna, Kano, Niger and other places where he has sold them. Although none of the wives was ready to comment on the ordeals of their husband and the involvement of their son, a member of the community who said that he knows the most wanted car snatcher in Niger State, told our correspondent that Maiturari is a “hard nut to crack” in the stolen car business. “Everybody in Paiko knows him as a person with highly questionable character, but people are even afraid of him because each time the police arrested him, before you know it, he will regain his freedom. “There was a time he was even shot on his leg and that is why you see him limping. Some of his children are involved in the business with him”. The Police Force Public Relations Officer, ACP Moshood Jimoh, described Maiturari as the most wanted car snatcher in Niger State. He assured that the apprehended suspect would be made to face the full wrath of the law this time around, saying that car owners can now go to sleep.